As parents we spend tons of time looking for the best kids stuff. Whether we’re trying to find the best apps for kids or the top toys for children there are lots of sites online that help you make decisions. 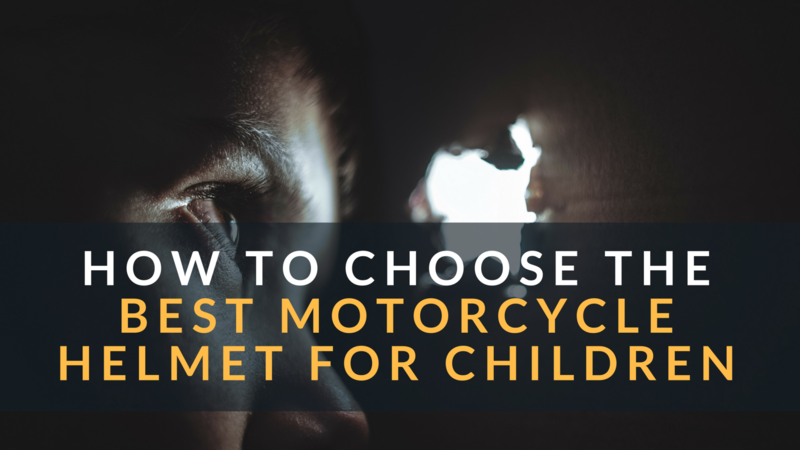 However, when it comes to safety, particularly motorcycles there isn’t much to help parents decide. It goes without saying that having your child ride on a motorcycle with you is risky and it isn’t recommended. However, if you are going to ride with your child onboard then you better protect your child and keep them safe. The very first thing you need to do is buy a children’s helmet. Parents often let children get excited about wearing a motorcycle helmet so they let kids choose their favorite one and kids often just pick the one that looks the coolest. A children’s motorcycle helmet is there to protect their fragile little heads so don’t just pick a helmet based on the way it looks. That’s a bad idea. Internal padding is the first one you should consider when you pick up a helmet. 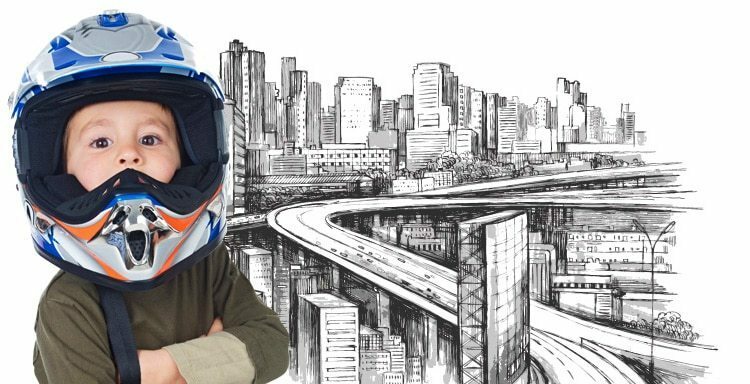 That may not seem obvious but a tight and snug fitting helmet is hugely important to its effectiveness in a crash because it minimizes the amount of back and forth that the head moves and softens any hard impact. An ideal helmet should have ample internal padding around the cheeks to provide a thick layer between a child’s head and the hard exterior and to keep a child’s head well buffered. The most popular standards for youth helmets are found in the DOT, EPSC and ECE standards (read our primer on helmet standards if you haven’t already). Personally, I suggest you look at Snell standards. Snell is an independent body that has to more rigorous requirements when it comes to helmet safety for both kids and adult. 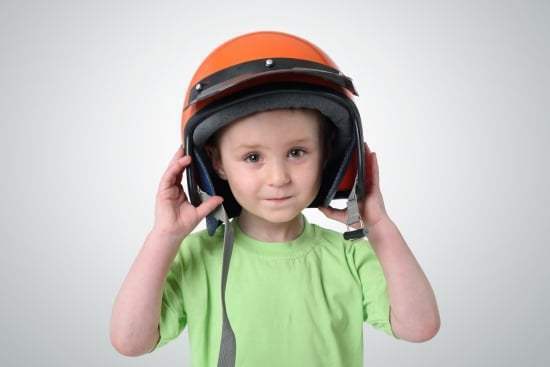 Just like adult motorcycle helmets, children’s helmets come in all sorts of styles. They include full face, open face, half face, modular and the off road helmets. Bottom line is that you should always buy a full face helmet for kids. A helmet should be also enclosed with a bar to protect the chin and jaw part. While there is a weight penalty for full face helmets which means kids may complain that it is heavy, that is a tradeoff worth making given what’s at stake. I’d rather a child have a heavy helmet that feels a bit uncomfortable. As your child is growing up so is the dimension of their head. Many parents tend to buy a helmet bigger size for them or even the adult size because they do not want to upgrade every few years. Don’t do that. This is an absolutely wrong approach and you should never do that. You do not want to let your kids wear helmet loosely because a helmet that is too big isn’t safe in a collision or accident. Buy a helmet that fits. If you’re worried about size you can buy one “slightly” larger but make sure the helmet supports the addition of liner and padding. 5. How to size your child’s head? Another element to consider selecting a kid helmet is the weight, a 100 – gram helmet is suitable for a child under 3 years old. You should always check your children helmet prior to letting them wear it by getting started with checking the stamp and logo showing the standards as well as testing from the inside. Next, consider if there are still any faults in the helmet and try to allow your children join in choosing. Do not force them to wear the one they do not like because it will cause the hate and inconvenient feeling to wear.